Looking for color in the spring months? with color and fragrance each spring. Being a dwarf, this lilac can grow in any sized garden or in a container. Looking for color in the summer months? Even the most resilient garden and gardeners can wilt in the long heat of summer. The long days of extended heat and few rains make the time until fall feel even longer. There are plants that seem to never waiver in their appearance. Cedars are one of those plants. We grow over a dozen cultivated varieties of cedars, from small dwarf to inspiring tree form varieties. They have the unique ability to live in climates that range from very cold to temperatures well above 100 degrees Celsius. Cedars' adaptable nature make them the perfect plants for the garden. 'Snow Sprite' (pictured right) is a cedar that litterally glows in the garden with its yellow-white needles. Its mounding habit and slow growth rate also make it a great fit for small areas in the garden. Looking for color in the fall months? Fall isn´t just the time of year to watch for leaves changing color in the garden. It´ s also the time of year where some plants let their gold shine. 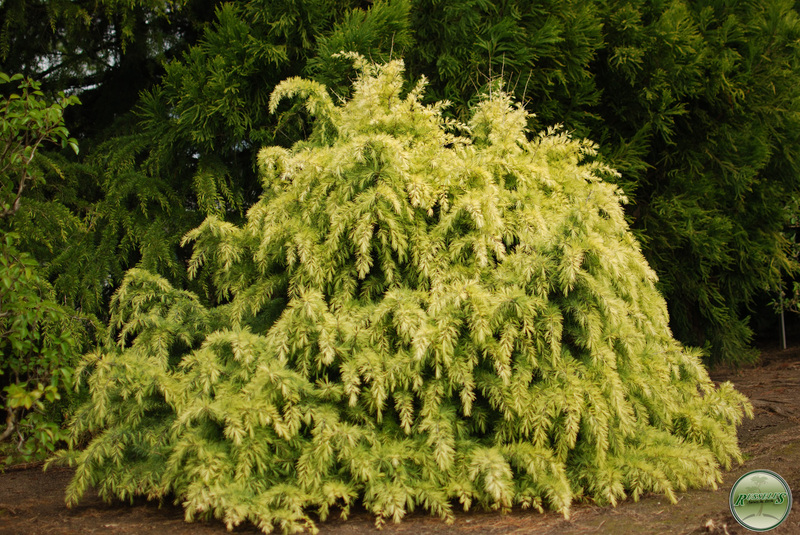 A large group of normally evergreen conifers decide this is the time of year to start turning from green to gold. The process begins in the middle of Fall and increases in color through out the winter. Looking for color in the winter months? Pinus densiflora “Aurea” is a medium growing upright (8’ in 10 years) that is hardy in a variety of regions (USDA zones 4 through 7). Its size and form make it a wonderful accent plant in landscape areas of various sizes. No matter what the landscape setting, however, this unique variety will provide enjoyment from the earliest spring flush, to its role as a “gold in the cold” treasure in the winter landscape.